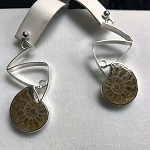 Bubble Jewelry - This is a handcrafted modern sterling silver pendant that frames a natural earth tones Ammonoid, Ammonite, Fossil Stone. This beautiful bold statement One-of-a-Kind necklace comes with a handmade 22" sterling silver adjustable chain. 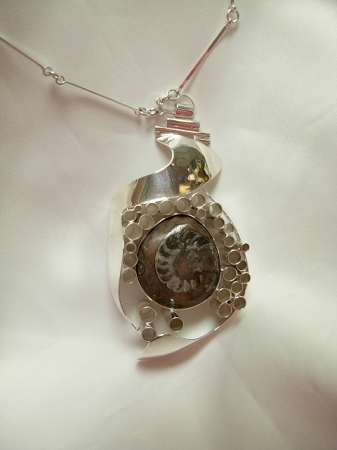 From our Bubble Collection, this is a handcrafted sterling silver statement pendant. 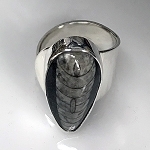 This modern piece uses traditional metalsmithing techniques. The pendant is begins with a silver plate that is hand-formed and manipulated to create a three-dimensional high polished enclosure for the sterling silver round tubes. The entire design frames a natural bisected ammonoid fossil, which is four hundred million years old Moroccan fossil. 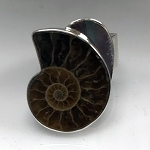 The fossil is fully bezeled in sterling silver. This unique pendant measures approximately 3.75" long x 2" wide. The ammonoid fossil is approximately 1.2" long x 1" wide (30mm x 27mm). The pendant includes a 22" sterling silver handmade adjustable chain. The clasp is a hook and eye closure.